Ok ladies (sorry, this might not apply to men), after a LOT of research, I have been using inositol (myo-inositol in powder form) for about 2 months now and I wanted to wait at least this long so that I can be sure that this is not a temporary fix. Inositol's benefits are extensively discussed on PCOS forums, but haven't recently been discussed on acne.org so I thought this might help some of you who do not want to take bcp or other hormonal treatments or would like to supplement hormonal treatments with inositol. Basically, inositol is a B vitamin but it's not typically included in B-complexes anymore because it can be produced inside the body. However, recent studies showed that women with PCOS or other hormonal imbalances might be deficient in inositol, so in my opinion inositol functions as a pro-hormone rather than just a vitamin (as does vitamin D). I have PCOS and low progesterone, and I also have symptoms of estrogen excess and high androgens, that's why I thought this would be a good multi-tasker. 1. Reduction of facial fuzz/hair (reduction confirmed by my esthetician) - inositol is also supposed to help with hair growth on scalp, but I haven't noticed too much of a change so far. 4. Fewer flare ups, pimples taking less time to heal (I noticed this about 3 weeks into it). PMS breakout was less severe last month and healed in 2 days. This month I skipped my ovulation breakout, which hasn't happened in over 1 year! Face feels flat, no pimples under the surface, just a lot of hyperpigmentation, red marks and scars (but at this point, I'll take what I can get). I should add that I'm also doing other things to control my acne because some of it is triggered by high histamines. What else I'm going: vitamin D prescription (3rd month), vitamin C twice a day, digestive enzymes with large meals, low histamine diet, gluten-free, low carb, low sugar, added more meat to diet, reduced grains. I also get regular facials with aloe peels, high frequency and red/blue light treatments. 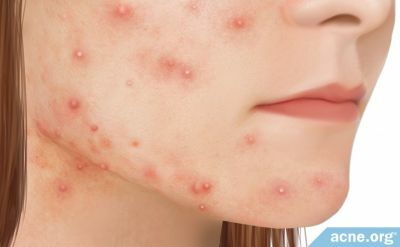 I think hitting acne from various angles is the most successful approach. One supplement or pill might not fix all your issues, and might even create new hormonal imbalances. Stress management and regular exercise are also important. 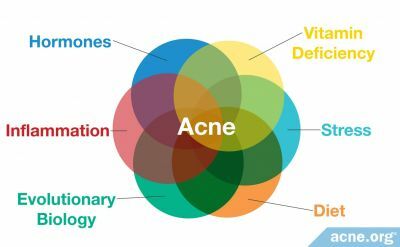 Just because you are taking something for your acne, doesn't mean you can be unhealthy in other aspects and just rely on a pill to do all the work. Anyway, just wanted to mention inositol as another option for you, with NO side effects at the recommended dosage. You have to work your way to the recommended dosage, which is 1/4 teaspoon per day. I started with 1/8 and felt a bit dizzy the first few times, but now I take about 1/4 teaspoon split into 2 doses twice a day. Inositol is water soluble, so it's best to divide your dosage. Don't take too much - less is more in this case and BE PATIENT. Do some research on it, most studies were done in Europe (Mediterranean). 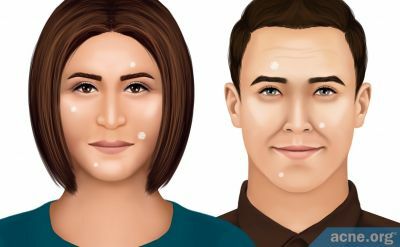 And speaking from experience, mediterranean women with PCOS have some of the most stubborn and persistent symptoms (like facial hair and acne), so it's very promising that they saw results in the studies between 8 weeks - 6 months. If you are interested, please read the following clinical studies and medical articles on the many benefits of inositol. Unfer V, Carlmango G, Dante G, Facchinetti F (2012) Effects of myo-inositol in women with PCOS: a systematic review of randomized controlled trials. Gynecol Endocrinol 28(7):509-15. Gerli S, Papleo E, Ferrari A, Renzo GC (2007) Randomized, double blind placebo-controlled trial: effects of Myo-inositol on ovarian function and metabolic factors in women with PCOS. European Review for Medical and Pharmacological Sciences 11: 347-354. Zacchè MM, Caputo L, Filippis S, Zacchè G, Dindelli M, Ferrari A (2009) Efficacy of myo-inositol in the treatment of cutaneous disorders in young women with polycystic ovary syndrome. Gynecol Endocrinol 25(8):508-13. Lam S, McWilliams A, leRiche J, MacAulay C, Wattenberg L, Szabo E (2006) A Phase I Study of myo-Inositol for Lung Cancer Chemoprevention. Cancer Epidemiol Biomarkers Prev 15: 1526. And my question is: Why the *&%# aren't there more studies on this, and why do doctors underestimate it as a supplement? Well, because then pharmaceutical companies would go broke, that's why. I had to see several doctors recently for some other health issues, and when they asked how I managed to get my acne under control and I said I was taking inositol they had no idea what it was. It just goes to show you that you need to do your research before relying on mainstream treatments that can have serious side effects. Inositol can have side effects for people (like diarrhea), but that does go away after a few weeks. Unfortunately I have tried everything including this and it didn't work for me at all. I don't think any treatment will at this point. In the studies I read, diarrhea and other side effects like dizzyness only occurred in doses higher than what I'm using. But hey, I'll still take these side effects over more serious ones. The 1/4 teaspoon per day should have no side effects, especially split into 2 or 3 doses. Are you male or female? Inositol will probably not work on men unless they have low progesterone. Beautiful results, WishClean! I am so so happy for you! You are also very pretty. (: Do keep us updated... you look very clear now, though! This gives me a lot of confidence in inositol if I were to ever try it, so thank you. Do you just buy the powder at a health food store? What brand do you use, and does that matter? Do you know if you can take inositol while pregnant? I'm not planning on it any time soon, but it would be good to know. I know progesterone is fine for pregnancy, but I don't think I would want to take DIM because it's an antiandrogen... maybe inositol would be a problem because of this too. Thanks for the kind words! In my eyes, I still feel like a train wreck compared to what my face looked like a year ago. It really took a hit. I didn't want to post too soon in case I was having a placebo effect, but I think 2 months into it with steady improvement is quite promising. And I wasn't even doing the full dose the first few weeks. I read some studies and reviews that say chiro-inositol works faster, but it's more expensive and harder to find. And I also read that combining inositol with l-cysteine can make it more absorbable, but I'm doing the minimum right now and I don't think I need to add anything unless the improvement stops. I also take 1 teaspoon of carob powder every day because that has some chiro-inositol, and it's cheap. Unfortunately, I have red marks and some scarring on the sides of my face, but for some reason I couldn't find the right angle to show that. I also have melasma/hyperpigmentation patches under my eyes from when my hormones were really out of whack, and I haven't been able to completely fade them yet. I hope they go away eventually, but sometimes they are permanent so I need to figure out how to cover them up at least. I bought the Source Origins brand because that's all they had in powder form at the Vitamin Shoppe, but I read some good reviews about the Jarrows formula inositol powder, so I might try than next when I ran out. Cool! Well, thanks again. (: Inositol is definitely noted in my mind now if I ever want to change my regimen. It's also good to know L-cysteine supports it, as I am already taking that daily. I'll have to look more into the pregnancy thing. Thanks, you too! At least we are exploring other options and getting results from regimens that most doctors have no clue about. Hopefully this will give other women hope, if conventional treatments don't work. Btw, what are you taking l-cysteine for? What does it do? I only know that it can enhance the absorption of other supplements, but I'm not sure what its benefits are on its own. Interests: Reading, Painting, Writing, Photography, Music, Music Festivals, Holistic Remedies, Supplements. I have been following a lot of your posts since I was recently diagnosed with P.C.O.S and I am interested in your shunning of conventional meds and the fact that you seek treatment through your own personal research and use of natural products and herbs. This is a route I too am seriously considering as I find that conventional medication is prescribed across the board - no matter what your blood results show. However p.c.o.s affects everyone differently and everyone seems to need medication specific to them - one size does not fit all. Can I ask - have you ever tried Vitex? Insitol seems to be working quite well for you - your skin looks lovely. Where do you do your research from? Totally! I'm glad that we're finding alternative treatments that actually work! I originally started taking L-cysteine for hair growth (I found out about its success in the megadose b5 hair-loss threads here), and also found out after-the-fact that it works to detox the liver. It's a little-known remedy for hangovers — anytime I take it on a night of drinking, I don't get a hangover the next morning. There are so many other benefits if you google it. Everything from supporting muscle mass, breaking down mucus, antiaging effects, protecting the stomach lining, and even preventing death from acetaminophen overdose. It's a pretty awesome supplement in my opinion. How much inositol is in 1/4 teaspoon of your powder? I've decided to start trying my multivitamin again. It's a pro-hair multi, which has 30mg inositol. I took it after spiro and saw hair growth, whether or not it was helping... but decided to discontinue so that I could for sure see how progesterone and DIM affected me without messing with other supplements. Hey! Yes, I tried vitex/ agnus castus twice. I got the actual tincture from the European country where it originates, so it was as pure as possible. It has its pros and cons, and it can cause serious hormonal imbalances if you don't need it (i.e. if your issue is not excess estrogen and low progesterone), or if you take it for a long period of time. Both times it cleared me consistently, but the first time it worked better because I was also taking evening primrose and acidophilus. I broke out big time once I stopped taking it both times because then your hormones become unregulated again.... But unfortunately, if you take it for a long time (over a year), it can create other imbalances, like high androgens. So this time I decided to not take any herbal treatments and just use supplements. The other time I got clear -- after breaking out when I stopped vitex -- I only did it by taking a good whole food multivitamin, acai berry supplements, regular exercise, and regular sun exposure. Well, I do my research mostly online, and I also read a lot of medical journals. I have a PhD but not in the medical field, and it's taught me how to do effective and critical research. I realized that when it comes to PCOS, most doctors know much less than actual PCOS sufferers because they usually don't even treat it as a serious medical condition, so I stopped bothering...I already know the options they will give me and I don't like any of them. Is L-cysteine sulphur-based? I know I have an allergy to sulfites (like in cleansers and food preservatives), but I'm not sure if I should avoid sulphur as well....I wanted to try NAC (which is another form of cysteine I think) and MSM supplements but I was worried they might cause an allergic reaction. If I could take it, then l-cysteine is next on my list (along with DIM)...you're right, it has so many benefits! There are 850mg in 1/4 teaspoon of inositol I think. 30mg is very low..what other ingredients does your multi have? I bet it has biotin. "Due to a lack of long-term safety data, it's unknown whether it should be avoided by pregnant women and nursing mothers. One review article suggested that inositol may stimulate uterine contractions, although no research has demonstrated that inositol actually has this effect." So very non conclusive, but I think even if there's a remote risk of uterine contractions, I wouldn't take it during pregnancy. L-cysteine is an amino acid which does contain sulfur. I believe NAC is the same since it is derived from L-cysteine. Thanks for the added info! I thought 30mg inositol might be really low. Yes, the multivitamin [here's a link] does have a large amount of biotin, but for me biotin only seems to work for a short while (I can tell with my nails)... maybe my body just gets used to it. L-cysteine and fish oil have worked better without decreasing effectiveness over time, and I'm strongly considering inositol now. (: I'll finish this bottle of the multi but if I don't experience any benefit I don't think I'll continue. I googled more about inositol and pregnancy, and it seems to be inconclusive for me as well. Some women on maternity boards are taking it in the first while of their pregnancy but I can't find any information on it being safe throughout the entire pregnancy. Thank you for the link! Thank you for your response. Ah I see. I have been taking it for a week now but the more research I do the more I'm not sure whether it is right for me to take it. I thought it balanced hormones, but it only balances the oestrogen and progesterone by affecting the lutenising hormone and on my blood test results I already have high lutensiing hormones, high testorterone and high androstenedoine. It is all very over-whelming and confusing and I am trying to research as much as possible. I don;t want to make my acne worse. Do you reccoment Vitex or no? I'm thinking of stopping it even though Ive only been on it a week and converting to Saw Palmetto as I feel its better for my needs...I wish I would have found out about all the herbal remedies earlier. Yeah I agree with doctors views on PCOS. Mine was pretty much like either go on birth control (which didn't help anyway) or deal with it. My endo is ok but I don't like the meds...I just don't like how harsh the drugs are and all the nasty side effects. Are you glad you took the route of herbs/suppliments? No worries, ask away! Online forums and the Internet are really the only places to get this kind of information since there aren't that many medical studies on herbs and supplements, esp. herbs. Unless you happen to find a good naturopath who specializes in women's hormones, which is hard to find. Some of the information on vitex is controversial. I read so much stuff about it and spoke with people who have used it to either get pregnant (it helps with ovulation) or clear their skin. Some sources claim that it helps balance androgens indirectly, in addition to regulating progesterone and estrogen. Based on my experience, both times I took it it definitely raised my androgens (or maybe it just balanced my estrogen and progesterone to the point where the androgen ratio was comparatively off) and I was getting increased body hair and a receding hairline. The first time, I took it for a bit over a year, and I was advised to only take it for 6 months. The second time I took it for less than a year. Both times when I tried to wean off it my acne came back. The first time I rebalanced my hormones simply by getting more sun exposure, yoga and other exercise, a whole foods multivitamin and acai berry supplements (antioxidants). So I'm hesitant to recommend vitex. In terms of acne, it was the most effective remedy I ever tried, it worked like a charm esp. the first time, but the second time I had a more complex hormonal issue so it didn't completely clear me. I had to also cut out gluten, which helped me a lot as well, and I was taking a multivitamin too. But when I stopped it was about 8-9 months the second time, and I was getting hives. I don't know if I developed an allergy to vitex or if the tincture I was using went bad (although the expiration date was still good) or if it was mostly stress-related, but I stopped taking it just in case. Hives is listed as a side effect though, so it's not unlikely. Depending on your imbalance, it might be beneficial to take both vitex and saw palmetto. If I had known about saw palmetto while taking vitex, I would have tried taking them both. In fact, some naturopaths make a tincture that includes both, along with other herbs like prickly pear cactus and licorice root. Saw palmetto on its own reduced my body hair slightly but gave me mid-section weight gain and didn't help my acne. That's why I think for me taking both together might have worked better, maybe for you only one herb might be enough, it depends on how your body will react. You have to give it at least 2 months though. Since you already started taking vitex, you should slowly reduce the dose if you want to completely quit....you've only been taking it for a week, so I don't think stopping it now would cause a problem but just to be safe cut down slowly. WishClean, do you think 600mg chiro-inositol in glucosmart is enough? In case you may not have seen some of my previous posts: I have been taking spiro for three years, glucosmart for two. I was previously taking metformin but weaned off of that after a year and replaced it with glucosmart. I live in a small town and have a very uncooperative and uniformed dermatologist, so I haven't been able to have my hormones tested, but my mom and I believe I have PCOS as a result of taking bc at a young age. 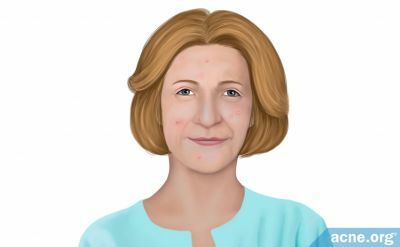 We have therefore treated my acne with PCOS treatments like spiro and glucosmart with success (until now). The reason why I've had to make so many educated guesses is because my dermatologist just kept giving me benzoyl peroxide or tetracycline and my doctor just kept putting me on every possible antibiotic, both to no avail. I do have many of the estrogen dominance symptoms, but the confusing part is, I had them months ago while my skin was still clear too. To your knowledge, does the myo-inositol work better for acne than chiro-? Is it possible to become resistant to inositol (maybe that's the problem, not spiro resistance)? And should the progesterone cream rebalance my androgen:estrogen ratio and thereby improve my acne (if ED is the issue)? You can have estrogen dominance and still have clear skin. For example, spiro gave me super clear skin but major estrogen excess side-effects. Even though spiro doesn't have a lot of estrogen effect, it still has some. For me it gave me an imbalance, so it might have for you too. It could be like WishClean said — the spiro is still working but for you it's no longer an androgen problem, rather an excess of estrogen in ratio to other hormones. Progesterone should help with estrogen dominance but it will take some time and consistency. Oh yes, I forgot that you mentioned this before, about how difficult it is to find a good dermatologist in your town...I'm guessing the same goes for endocrinologists. 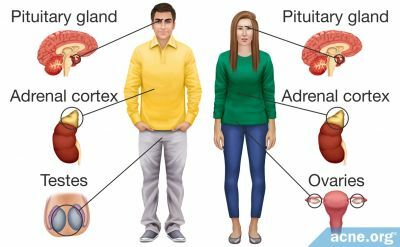 Some estrogen dominance symptoms coincide with low progesterone symptoms, so sometimes it's hard to pinpoint if both of those are off or just one. I had issues with taking only anti-androgens (I tried androcur, saw palmetto, and spearmint tea): they lowered my androgens a bit (decreased hirsutism) but also gave me mid-section weight gain and mood swings...I felt like I was PMSing 24/7, I was so bloated and moody. So yeah, sometimes you need more than 1 supplement/pill to balance your hormones depending on your situation....and hormones do fluctuate, so it is possible that what was working for you in the past might no longer be working for you. Like hearts said, you can have estrogen dominance symptoms without the acne, especially when the ED is in its initial stages. To target ED, maybe DIM might be more useful to start with, but I haven't taken it so I don't know yet. Based on hearts' experience, it works really well. Btw, how bad is your acne? From your posts, I get the impression that it's now very mild....so it could be subsiding slowly, or it could have been caused by something temporary like extreme stress (for instance, by elevated cortisol, rather than the other hormones we were discussing). Or you could have a thyroid problem in addition to high androgens...you'd be surprised how many women with hypo or hyper thyroidism go undiagnosed because doctors don't usually order all the thyroid tests, just the basic ones that don't detect underlying thyroid issues. In that case, iodine could help, but only if you have hypothyroidism, not hyper. So this is just another possibility.....our bodies are so complex, it's hard to pinpoint the cause. About inositol...I haven't tried chiro because it was hard to find and expensive, but I have 1 teaspoon of carob powder in my tea every day, which is supposed to be the best source of chiro from food. Myo worked quite fast for me, and I read on the PCOS boards that many women prefer myo over chiro simply for convenience reasons...although you need to take more myo than chiro. But still, the powder form works for me, and my liver doesn't have to work extra to break down the supplement because it's not in capsule form. 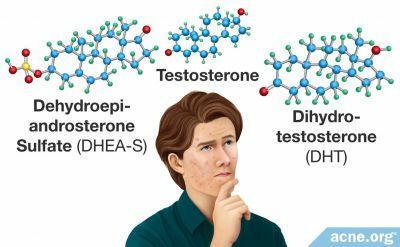 Inositol is basically doing what the progesterone cream is: boosting your progesterone; the difference is that it also directly lowers androgens, while progesterone cream indirectly does that by balancing everything out (ideally). I did read testimonials on NPC reviews where some women complain that the cream no longer works for them after some years. I suppose the same thing is possible with inositol, but unfortunately I haven't been able to find any definitive information because most women mainly take it for ovulation to help them conceive, and once they do they stop taking it. I had the same issue with vitex: it worked like a charm at first, then after a few months it boosted my androgens to the point where I was getting extra body hair even though my skin was nice and clear. I'll keep with it and let you know about my progress. I'm really hoping progesterone cream is the answer, because as I said, I do have a lot of the estrogen dominance and/or low progesterone symptoms but I also have some of the high androgen symptoms. Regardless, so far NPC has helped with my anxiety and sleep, fingers crossed it resolves my acne! You can have estrogen dominance and still have clear skin. For example, spiro gave me super clear skin but major estrogen excess side-effects. Even though spiro doesn't have a lot of estrogen effect, it still has some. For me it gave me an imbalance, so it might have for you too. It could be like WishClean said the spiro is still working but for you it's no longer an androgen problem, rather an excess of estrogen in ratio to other hormones. Progesterone should help with estrogen dominance but it will take some time and consistency. I WISH I had mild acne. I have nodular acne, which are huge, hard, painful bumps under the skin. I'd trade my right arm for mild acne. Maybe you thought it was mild because I mentioned how my crazy dermatologist gave me bp to treat it (which of course didn't do anything). All the more reason why I rely on this forum for information. Good info about inositol and I'm going to investigate what you said about the thyroid as well. Thanks. One more thing about inositol. The myo-inositol I'm taking is best taken on an empty stomach. Glucosmart is supposed to be taken with a meal. I read that inositol is absorbed better on an empty stomach, but taking chiro on an empty stomach might cause dizzyness, whereas myo is better tolerated on an empty stomach because it's not as strong. If you take it with food, it will help with blood sugar/insulin, but if you take it on an empty stomach it will have therapeutic purposes. It's kind of like digestive enzymes - if taken with food, they have an impact on the meal you take, but if taken on an empty stomach they help the immune system and the digestive system in general. So maybe if you switch to myo you might try that instead. Also, you mentioned you've been getting some facial hair? Low progesterone can also cause facial hair, not just high androgens. That's why it's so hard to be 100% sure which specific hormone(s) is/are causing your imbalance, because so many symptoms overlap. I'm glad the NPC is helping you with other issues...this might be a sign that it's the right treatment for you. And if you feel that you need another supplement, you can always try myo and see if it works bc it's been a multitasker for me. That's very interesting about taking inositol on an empty stomach. I'm definitely going to try taking my chiro-inositol (glucosmart) on an empty stomach and if I get a bad reaction then I may pick up myo-inositol and try that instead. Ya, I have blonde hair, so it's not like I have a full moustache or anything, but concurrent with this resurgence of acne, I have noticed more stray facial hairs. The low progesterone versus estrogen dominance versus high androgen versus PCOS symptom overlap is very confusing! I'm very much hoping that using progesterone cream will balance my hormones in general and ultimately heal my acne. Apparently buckwheat is a good source of inositol, in case someone is interested in dietary sources. I think I'm going to have my buckwheat pizza more often from now on. Edit: Here's a more comprehensive list. Yes, try that and let me know how it goes. Although I think myo-inositol would work better on an empty stomach than chiro. It's so frustrating that symptoms overlap, it makes it hard for us to self-diagnose. But then again, it's not like conventional blood testing can detect some imbalances anyway. Thanks austra! I want to start baking with buckwheat too...how do you make buckwheat pizza, and can I make it without tomatoes? l haven't had pizza since I discovered that tomatoes raise my histamines. I dissolve a teaspoon of carob powder into my tea every morning to get some chiro inositol. On its own it doesn't have much sugar and doesn't impact glucose. I need to find some carob recipes because it tastes pretty good. Good to know. I'll try it with the bottle of glucosmart I have, and then go for myo- if I have a bad reaction. I recently read a two page article in Reader's Digest on the use of progesterone cream to treat PCOS. So that's encouraging. I hope it fixes my acne really soon, as I hate caking on the coverup! Great, let me know how it goes. The progesterone cream can take a few months to work, it's one of the slowest hormonal treatments, but it's becoming popular with women who don't want to take progestin or synthetic hormones, so I hope it works out for you! I might give it another try if inositol is not enough, but switch to the brand hearts is using. Are you also using the same brand as her?